This is the first of two nights in Tokyo, at the beginning of what would be their longest tour of Japan, consisting of 15 dates. Freddie noodles what seems to be the intro to Father To Son before Spread Your Wings. Brian, after Love Of My Life: "It's your turn. You have to sing along with this one, or we'll kill you, okay? This is '39." Freddie is in great voice on this night, but it will soon weaken for the remainder of the tour. Tonight he turns in a gorgeous rendition of Bohemian Rhapsody that surely eclipses the version from Live Killers recorded a couple months earlier in Frankfurt. During a TV interview the next day, based on this show Brian May points out that their Japanese audience is maturing, listening to the music more than they used to. The first photo above was taken by Koh Hasebe. 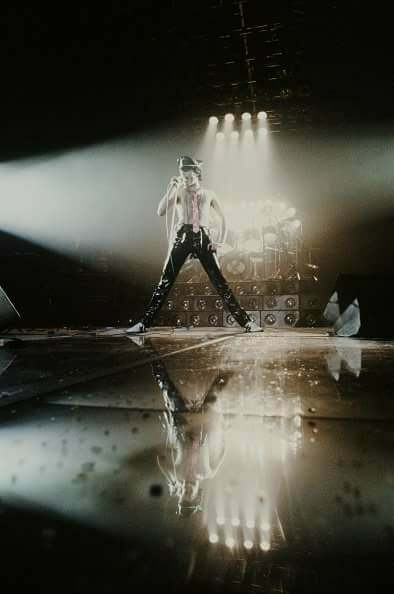 The famous photo for the front cover of Live Killers was taken at the end of one of the Japanese shows, and the last picture above (taken by Koh Hasebe and found in a 1979 Japanese book called "Queen 02 Archive Book Guide") was snapped right around that moment. The other pictures in the second set could also be from any show on the tour, the second of which was submitted by Alessio Rizzitelli. The first half hour of the show is missing on this recording. For some reason the bass drum is its prominent feature. Tarantura released half of this show in October 2016, appropriately titled since it would seem that the taper showed up about an hour late. It is part of a 3-disc package including the April 24th show at the same venue. This third source is a very nice recording, and almost the complete show.